Although the day had no clouds to add interest to the sky, this image was shot on a cold crisp morning and the sun was positioned just right to be diffused by the rising spray. I really liked the balance of the cold blues and aquas with the warm orange and yellow sunlit edges of the falls and sky. Blue hour above the Canadian Falls. Thi was one of those shots that just aligned perfectly. Out of a number of shots, this particular one was the only image where the spray seemed to be rising up to the moon. Light winds move the spray column all over the place. This has always been one of my favorite images. The photo was taken in 2016 from the American shore looking towards Goat Island. The setting sun had just enough warmth to illuminate the rapids at the same level as the rolling clouds. The movement of both complimented each other perfectly. After our most recent two day snowstorm and my endless shoveling I had to get out the moment it ended. This was photographed at golden hour looking across the Niagara River towards the frozen shore of Goat Island. The top of the American Falls can be seen on the right edge. By the time I was done all my gear and myself were coated in ice. It was about 20 degrees and the wind was blowing west to east. It was all worth it in the end I think. Over the winter at Niagara Falls, layers of ice build up from the mist of the water flowing over the edge. In the middle of the coldest months this ice gives the falls an ethereal quality. As spring arrives and the ice begins to melt, the flowing waters begin to erode the huge ice boulders, exposing the layers of ice and the sediment that has become incased there. Eventually the ice disappears but for now you have these interesting layered ice boulders appearing like sandstone below the American Falls. One of a series of images taken over a two hour period of the Horseshoe Falls from the Canadian side of the Niagara River. It was interesting recording the changes in color and drama as the light and clouds changed over that period. Niagara Falls, Canadian Horseshoe Falls at last light during sunset. This is the last of the images I took over a two hour period in a single location. When it's this cold (9-16 degrees) the mist at Niagara Falls freezes and filters the setting sun in amazing ways. 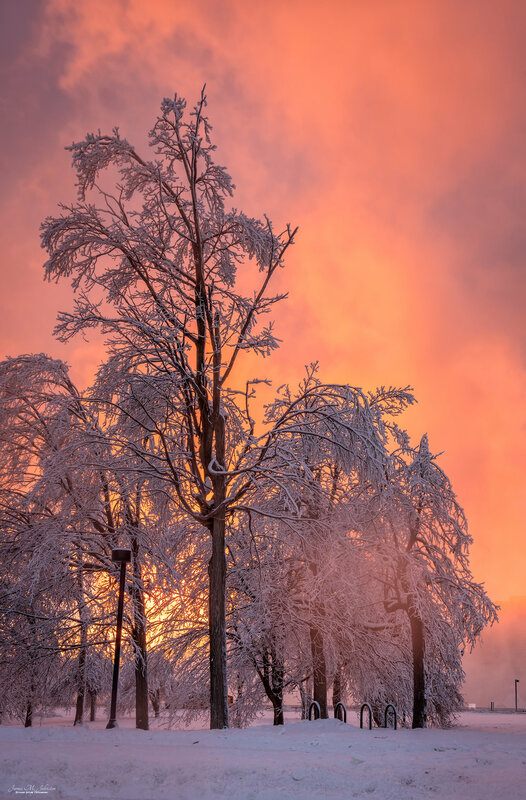 The frost coated trees are like beautiful jewels in the pink and orange light. Icy buildup on this tree during one of the cold snaps this past winter along with the crust built up over the snow on the ground, make a beautiful foreground for the setting sun coloring the ice mist in the air. This is one of the beautiful effects of Niagara Falls in the winter. Sometimes an image provokes an emotion or thought that is unexpected. I am not a religious man at all. You could say that nature is my spiritual guide. 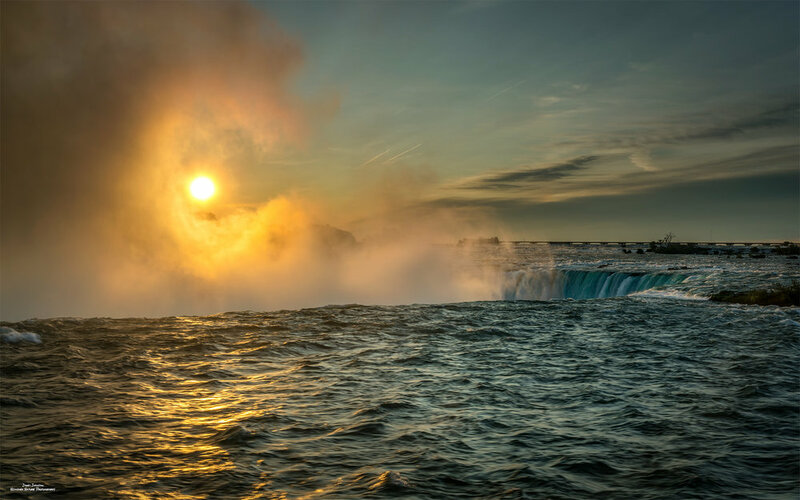 That being said, the way the mist is swirling around the rising sun in this Niagara Falls image made me think of a vision of creation in a way. That one single moment that the mist parted, lit the water in such a magical way. Pink skies over Niagara Falls as the sun begins to illuminate the clouds. Another beautiful sunrise comes to this amazing sight. Many people don't realize that the decking at the Cave of the Winds gets torn down every fall and rebuilt every spring. The season ends in a few weeks and I wanted to get some shots without the crowds that are present during the high tourism season. This is as high as I could go as the process began last week. Lots of lens wiping and camera covering. A panorama showing the entire American falls complex at Niagara Falls State Park. This panorama is a stitch of five images. Niagara River Rapids #3 - The last light of a cold autumn evening and the last light of orange leaves as the colors of fall come to an end. Number four in a series of Autumn images taken at Niagara Falls State Park in western New York. The focus of these images is on the flow of water and it's interaction with the land. Every year Niagara Falls, Ontario adds amazing lights and decorations at Christmas. Along with the already well lit skyline and waterfalls, these decorations add lots of color to the nighttime skyline view. This is the first of a series of images showing details of Niagara Falls in the depths of Winter. This image is an afternoon shot of the American Falls going over the edge. A long deep freeze leaves the base of Niagara Falls frozen in this early January image. I was lucky to get one really decent shot before ice crystals formed on my polarizing filter. The morning light of the sun filters through the icy pellets raining down from Niagara Fall's rising mist. The temperature was 20 degrees and the light breeze was blowing the ice crystals down on the Canadian side of the Falls. By the time I walked through it, I was coated in ice and the a7R II, Nikon and tripod were encased as well. As a photographer I love to look beyond the standard visuals when I'm walking around Niagara Falls State Park. This little cascade is in one of the pass throughs around the "Three Sisters" islands on the Niagara River above the falls. 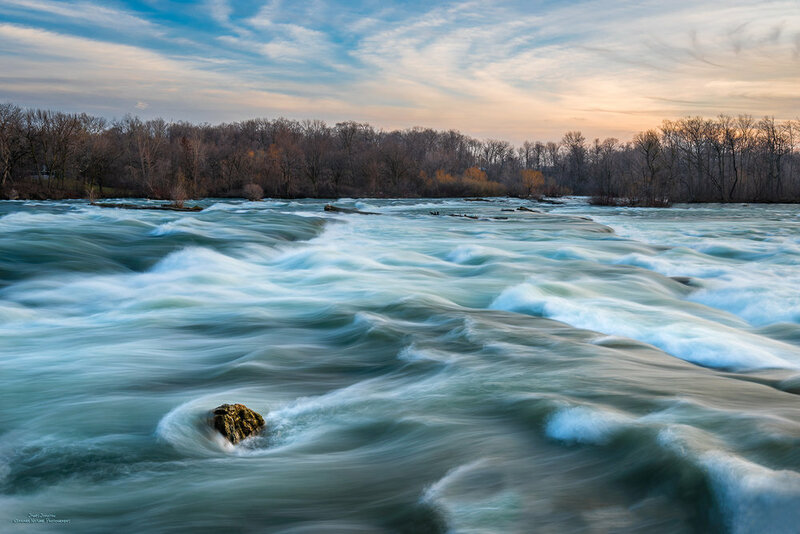 A golden hour photo of the Niagara River Rapids flowing under the access bridge from Niagara Falls onto Goat Island and the main state park.